Near the end of our trip to Maui for Andy and Sugi’s wedding, I had the opportunity to kayak in the ocean. 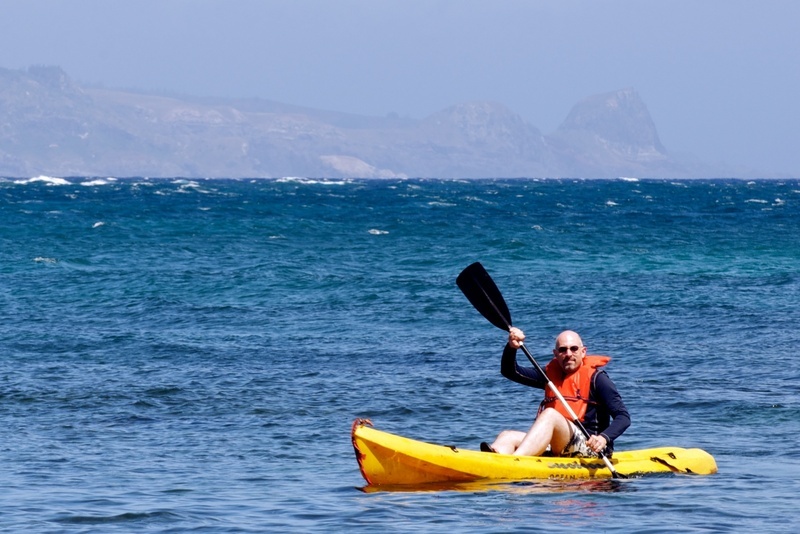 While I had kayaked once before on the Wailua River on Kauai, this was my first time kayaking in ocean water. While Tawn took a yoga class, Andy, Sugi, and I went to Sugi’s family compound nearby in Paia. After hosing off a long-unused kayak, Andy and I carried it down a steep and untended cliff, giving me the first of many cuts and scrapes. Eventually, we launched the kayak in the shallow waters of the cove. Sugi and her cousin watched from the comfort of the lawn some twenty feet above and Andy snapped photos as I headed towards the surf. The water remained shallow – not more than ten feet at its deepest – and I could see the lava rocks and coral as I paddled by. 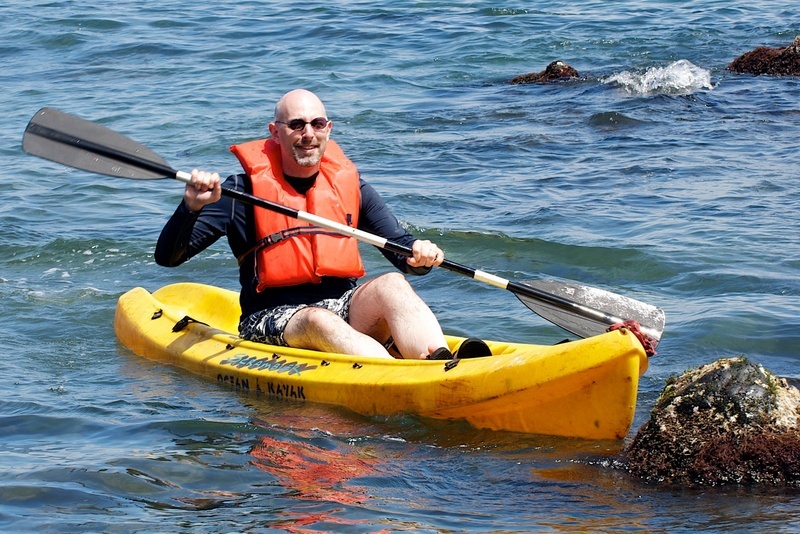 This one-person kayak seemed much less stable than the two-person kayak I used on Kauai last year. It wobbled readily and I became very cautious when it was time to turn around. A few hundred feet from shore, the gentle swells became large enough to threaten to capsize my vessel. I paddled out and back a few times before leaning too far and pulling too hard with the paddle, dumping myself into four feet of water. 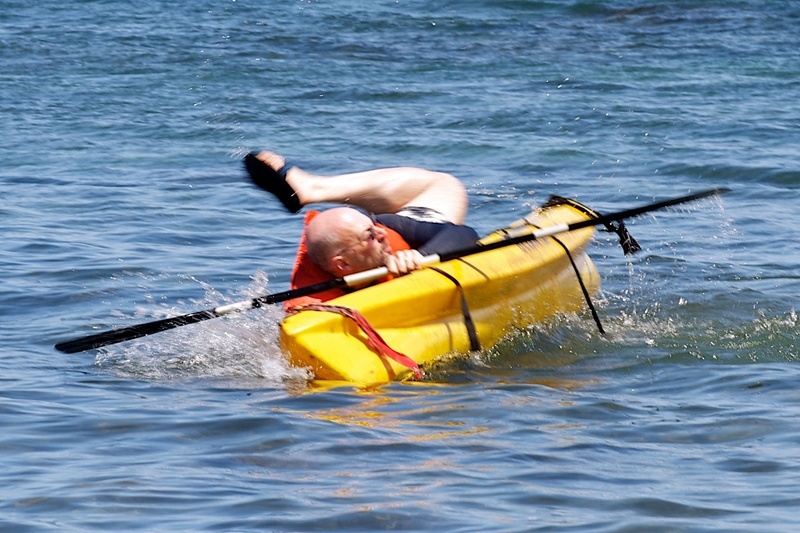 The capsizing wasn’t a problem – I’m an able swimmer, wore a flotation device, and could touch bottom. The problem was how to get back into the kayak. Nobody had taught me that! Turns out, it is much more challenging than I had imagined. After a few failed attempts, I floated the kayak into much shallower water to start again. Eventually, I managed to seat myself on the kayak again and paddled for another fifteen minutes or so before returning to shore. Surprisingly (or not), Andy decided he didn’t want to try his hand at ocean kayaking. My repeated falls and poor choice of footwear (flip-flops = bad for kayaking) resulted in a cut knee and scrapes to the tops and sides of my toes. These injuries were worsened when we were carrying the kayak back up the cliff and my left leg fell through what I thought was a solid mass of dried palm fronds. Turned out they were covering a crevice between too tree trunks. Oh, well – what’s an athletic adventure if there aren’t some injuries, right? This entry was posted in Uncategorized and tagged Hawaii, Kayak, Kayaking, Maui, Ocean, Sport, Sports by christao408. Bookmark the permalink. Odd… just got an error message while commenting on your entry.I’m procrastinating for a bit and snuck into Xanga. Your entry was a nice treat although it was at your expense. I hope your foot got some tender loving care that night (ice, ointment, foot massage, gentle kisses – ok, maybe not the kisses).Back to work … take care Chris! Wow Chris, that was scary. Loved the sound of the ocean and the ripples the oars made when they touched the water. Hope your toes and feet are all healed by now. I have kayaked on the inlets here and rivers but never in the ocean. And I have to admit it was in two person kayaks. To be honest I never could master back into a kayak that was turned over in the water. Despite the injuries I am sure you had fun – going to do it again? Exciting adventure, very well illustrated. Still makes me laugh.It was definitely another unforgettable memory! @yang1815 – Yes, something we will remember until we are very old, I’m sure. @Inciteful – Thanks – I keep trying to remember to balance the pictures with the words so entries aren’t too wordy! @Fatcat723 – Glad I’m not the only person who has problems re-entering a kayak after being dumped. I would definitely do this again. Down in Krabi province, Thailand, there are beautiful lifestone formations in the ocean that you can visit by kayak. Perhaps I can try again there. @ZSA_MD – The ocean sounds are very peaceful. Could just bob out there in the water for a few hours, enjoying it. @beowulf222 – I think some of that “flexibility” is more a matter of the angle from which Andy was shooting. Sadly…. @amygwen – Sure was!